DOMINIC FRISBY: "If I am proved right, I would expect to be at least made a knight of the crypto realm and made the official minister of forecasting"
Things have quietly perked up in the land of crypto, and there are grounds for some cautious optimism. I’ll explain why in just a moment, but let me start with some big picture stuff. In an ideal technical world, this is the scenario I am looking for: that $3,200, the low Bitcoin made in December, is the low. We then enjoy a gentle rally through the first half of this year, before a retest of the low sometime in the autumn (or “fall” as our US cousins call it). We would then want to see that $3,200 area hold on the retest. Then we have a nice double bottom in place, and a firm base. Moreover, we would have had a bear market of close to two years and an 85% correction in price. That’s enough of a correction in terms of both price and time to purge most of the excesses of 2017. I’m not wishing ill fortune on anyone when I say all this either. I am just describing the kinds of scenarios which are common to bear markets – not just in tech, but in all sectors. Losses are an unfortunate part of that, and these are the kinds of things we need to be looking out for. The better operators will survive and likely become the new leaders in the space when the next cycle gets underway. Turning now to the shorter-term picture and the outlook for the next few months, I am feeling quite positive. Let’s start with a chart of Bitcoin. On the chart below, I have drawn three simple daily moving averages – the 21 DMA in red, the 55 DMA in blue, and the 233 DMA in green. 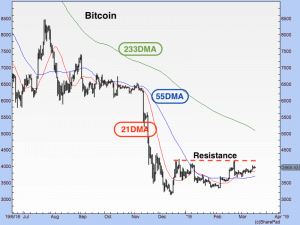 You can see that Bitcoin has now got above both its 21 DMA and its 55 DMA, and both are sloping up. That is a positive move and indicative of a rising trend, at least in the short term. In addition, it is also worth noting that the February low was higher than the December low. The March low is also higher than the February low. Higher lows are good. There is a line of resistance at the $4,200 area – where I have drawn the dashed red line. If Bitcoin can get above that, we will have a short-term breakout. $4,200 is Bitcoin’s next hurdle. If it can get above there, then the $5,000 to $5,500 area comes into play. There is some resistance there, and even more at around $6,000, which was support for Bitcoin through so much of 2018. Just in terms of historical price levels, I think there is a distinct possibility Bitcoin stumbles at $4,200 but gets through. I would say it stumbles again in the mid-$5,000s, before going up to the $6,000 area by the summer. It will then retest that zone a few times – there is a buzz, Bitcoin is back in the news and so on – before it gives up the ghost. That’s the point at which we then go back and retest $3,200. I’m all too aware that what I am forecasting is far too precise. Please don’t bet your house or anything significant on it. What I am describing, however, would be classic bear market action. I am merely projecting that onto Bitcoin’s existing price levels. We could just as easily fail at $4,200 and the sector could plumb to new depths. Nobody knows! Such are the hazards of investing and speculation. I do sometimes, however, have a nose for these things, so if I am proved right, I would expect to be at least made a knight of the crypto realm and made the official minister of forecasting. In other news, let’s discuss the Tulip Trust. This is a trust rumoured to have been set up between Dave Kleiman and Craig Wright some years ago. Kleiman was a Florida-based US computer forensics investigator who died in 2013, thought to have been one part of Satoshi Nakamoto. Craig Wright is an Australian computer scientist who claims to be another part. The Tulip Trust is rumoured to contain Satoshi’s Bitcoins – or a large part of them at least. (Satoshi probably has somewhere between 700,000 and 1.2 million coins, depending on whose research you follow. Either way, there are a lot.) In 2020, the coins in that trust are to be moved to a third party and can be sold, so the story goes. A lot of this is hearsay, I stress, and at present, there is a legal dispute between Craig Wright and Kleiman’s estate. One of the issues in dispute is believed to be access to the keys. Many people think the whole dispute is bogus. That might be so. But rumours are powerful things nonetheless and, as the year goes by, we will likely see it get some oxygen. A narrative will creep into the conscious that 2020 will see large volumes of selling as Satoshi Nakamoto’s Bitcoins become free trading. If so, the latter part of this year might see some selling in anticipation of that. Perhaps that is what will take us back to $3,200. Like I say, there’s a lot of ifs and buts, but when it comes to rumour and narrative, fiction can be as powerful as fact, so whichever side of that divide the above story fits into may not be that important. What is important is that there is a story at all. It’s something I shall be looking out for as the year passes. In the interim, however, we have a short-term uptrend. That is good! For more news, guides, and cryptocurrency analysis, click here.